Alexander Peskanov is a pianist and composer who has appeared internationally with the London Symphony Orchestra, the English Chamber Orchestra, the Polish Chamber Orchestra, the National Symphony of Costa Rica, and the Hong Kong Philharmonic. In the United States Mr. Peskanov has performed with the National Symphony Orchestra and the symphonies of Baltimore, St. Louis, Houston, and Utah. Musical collaborators include Yo-Yo Ma, Maurice Andre, Jean-Pierre Rampal, and Ilya Kaler. After graduating from the Stoliarsky School of Music in Odessa, Ukraine, he went on to receive his Masters degree from the Julliard School of Music in New York, studying with Ania Dorfmann. 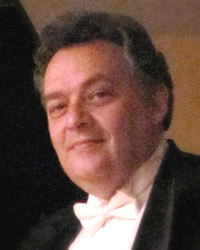 Mr. Peskanov is currently a Naxos recording artist and resides in New York with his family.